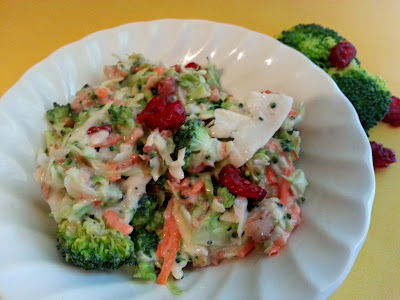 With this recipe I was trying to copy cat the broccoli salad that I get from the Wal-Mart deli. Let me be honest ... I like this recipe even better! So, when I was making it I didn't measure anything, I was just going by what it looked like. That makes it hard to write a recipe! I can approximate amounts that I used, and it is very easy to adjust this recipe. One step!! Toss it all together and let it chill for an hour. You can easily adjust amounts on this, especially the amount of dressing. Some people like it lightly dressed, and others like it swimming in dressing. I would suggest that you add it a little at a time while you toss the salad.